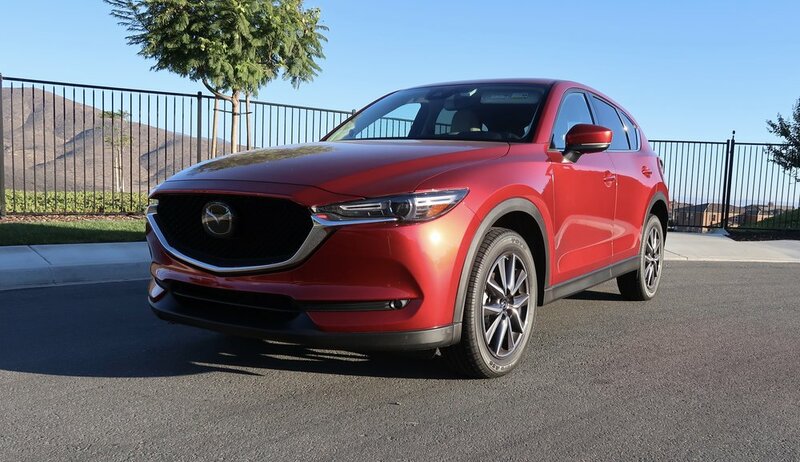 I recently had the honor to review the 2018 Mazda CX-5 Grand Touring AWD (MSRP: $34,340) a couple weeks ago for a full week. I previously reviewed the 2016 model and have to say that I really enjoy the CX-5. The exterior color that I tested was Soul Red Crystal Metallic with the interior color as Parchment. The color stands out like jewelry. Seriously, it has this beautiful eye-catching shine even with a few weather interruptions. When opening the door, it has a keyless entry system which helps when your hands are always full. No need to dig to the bottom of your purse for keys. The interior is this clean, sleek, simple look in a luxurious way. It has an off-white tone leather that just refreshes your drive. Open the sun roof, turn on your favorite music spilling out those Bose speakers and your drive is set and ready to go! One of the many things I liked about the CX-5 is the safety features to make it more of a comfortable drive every time. One feature you will see firsthand when you start the car is the head up display. When you are looking straight, the inner windshield will display a holographic speedometer. With this, it will display the speed limit allowance in the perimeter you are in. Oh, and it detects stop signs to let you know you are coming to a stop sign and must stop. The blind spot detection will light up on your side mirrors and a sound will beep when it's not safe to change lanes. Speaking of lanes, it will alert you when you are also gearing out of your lanes so that you are well alert for safer driving not only for you but those around you. Let's talk navigation. This omits typing manual entries into the navigation when the car is moving. In order to do so, the car needs to be stopped. It however is able to search categories of what's around you. You also get bluetooth capability so your hands are free at all times should you receive a call or need to make a call out. The back up camera is very helpful to have that extra clear view when parking. I have 2 driving aged kids and these are PERFECT features to help them gain the habit of safe driving. This means a lot when as parents, we are unable to always be with them to watch over them. Another favorite feature is the space you get with this SUV. When you have a small family, the CX-5 gives you more than enough room. Not only does each seat give you plenty of leg room, but the trunk is spacious! If it passes the Costco test, it's a winner in my book! Yes, I said it. If you need to put the back seats down for things like bikes and more, you can absolutely do that for more room. To close the trunk, there is an easy button that closes your trunk securely or just do it manually. The CX-5 just makes life simple for the daily life of everything. It welcomes you to heated seats and steering wheel. The back seats have this feature too, along with A/C ventilation. Maybe your back seat guests also need USB and charging access, its all covered. Need to hang clothes on a hanger, got that covered too. The CX-5 has decent mpg with gas being 26 city/hwy, 24 city, 30 hwy and a great smog rating of 7/10. The drive has good pick-up and a smooth easy handling so you're not all over the place with your coffee in your hand and or your car. Takes turns pretty well as we've been on a few swirly roads. The LED headlights helped make the drive even more better with lighting the way! -Voice activation for navigation since manual typing isn't an option when vehicle is moving. -More user-friendly traffic option. The live update on current traffic was hard to access or navigate when stopped and/or mobile. This is one I use everyday. This helps me take the best routes on my daily destinations. If you want to see what it feels like yourself, take a few minutes to test drive one at your local Mazda dealership and see how well it suits your needs.